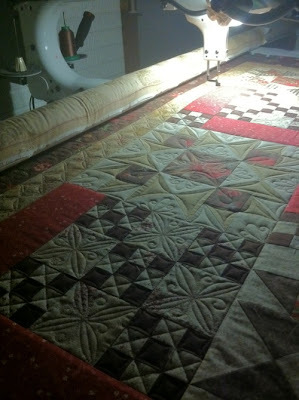 I have another one of Thelma's gorgeous quilts to share...Mocha Trail!! I remember Thelma mentioning that she wasn't totally in love with this quilt. She wasn't sure how she felt about the star blocks. That thought was my driving inspiration. I wanted to quilt this quilt in a way so that Thelma would love it. I quilted the way I would want it to be quilted if it was mine. (I wish.) Guess what? It worked! Thelma LOVES her quilt!! As do I. The combination of the fabric and quilt pattern makes for a bold quilt design. I was really stumped at first on how I was going to quilt this so that you could see the quilting and how the quilting could add to the design. 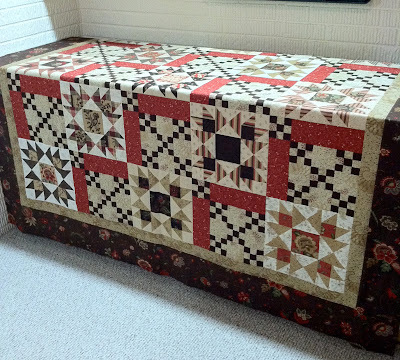 I was thrilled when I finally came up with a design that flowed with the quilt. Here's a closeup of the block designs. A lot of detail quilting, but worth every stitch!! Of course, I had to add some feathers. In the borders as well as the red rectangles. Those are my favorite. I had the feathers move in opposite directions in each row. That way the quilt could be used in any direction. A few specifics on this quilt. All the quilting is freehand. I used Hobbs 80/20. I had 3 thread changes. 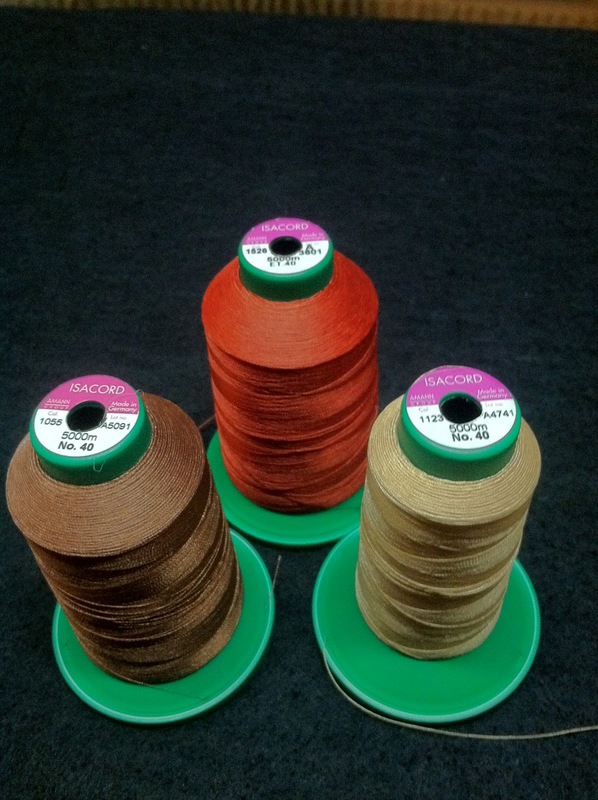 I used Isacord top and bobbin. I haven't used Isacord in a while. I forgot about how much I love this thread!!! It has a little sheen to it. Not as much as Glide. It looked just perfect on this quilt!! You can tell I used quite a bit of the tan. To read more details about this quilt, click on Thelma's posts here. I like how the red sashing zigzags throughout the quilt. A unique look. As beautiful as the quilt is, it is always the quilting that really makes the quilt and you really outdid yourself on this one. I love the quilting and the designs, hoping I can do some like that on one of mine. How stunning Linda - yep, I can see why she loves it now! You did a gorgeous job! Fabulous Quilting! I can see why Thelma sends her quilts to you. Your quilting is amazing Linda. Thelma's quilt is beautiful and your quilting is just frosting on the cake... what, make that Cupcake! Linda, you did an amazing job once again! It is gorgeous! Your quilting is amazing, Linda! Wordless in a very positive way! As others have commented: stunning. Simply stunning. A real treasure. You and Thelma are quite a combo! This quilt is just gorgeous!! 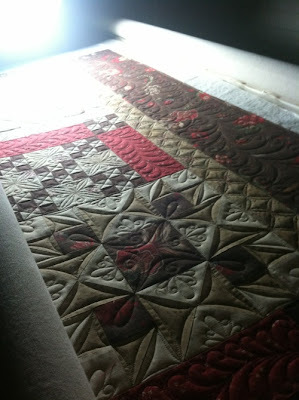 I love how the feathers in the red rectangles dance across the quilt! Your quilts/crafts are so fantastic! Another stunning quilt - I love seeing how your quilting brings the top to life! I'm just in awe of your quilting! Even if I had the talent (which I don't) I know I wouldn't have the patience! This quilt is stunning! first I swooned (*smile) and then I fell in love with the trails. Beautiful, beautiful, beautiful. You are doing so great! Gorgeous! Your custom quilting skills are amazing. I love this fabric too! quilting artist. I look forward to more of your beautiful work. Wow! Beautiful beyond words! Thanks for taking so many great pictures :-) It is just amazing! Spectacular! I'm sure Thelma was thrilled :-) I know I would be!! I'm running out of words to describe how beautiful your quilting is! Stunning is the best I can come up with at this point. 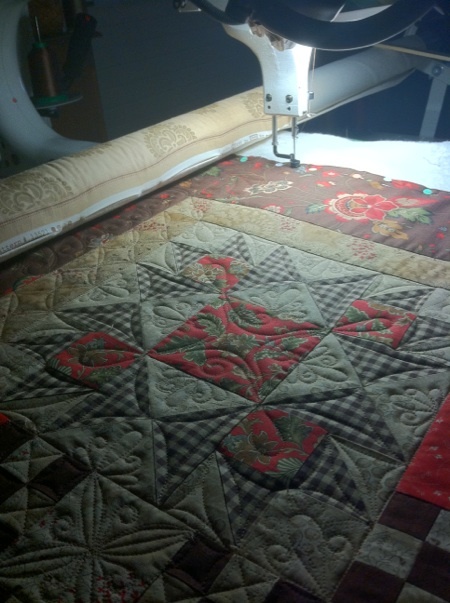 What a great combination you and Thelma make; your quilting is as impeccable as her piecing... I see many blue ribbons in your future! Thank you so much for explaining your process. You did a beautiful job picking the right designs to highlight Thelma's piecing! Way to go! !